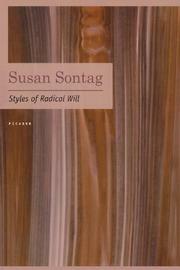 It is becoming difficult to sustain any fervent interest in Susan Sontag's career. Her critical ideas, embracing everyone from Hegel to Walter Benjamin, appear more and more merely polemical excursions in phenomenological or structuralist thought. Against Interpretation had its topical cachet: a bubbly belligerent advocacy of "camp," happenings, Levi-Strauss, the nouveau roman, Artaud. What it lacked in intelligibility, it made up for in le dernier cri. With Styles of Radical Will, the avant garde pantheon opens its doors to Cage, "the pornographic imagination," "the theory of art as assault on the audience," New Left politics. These essays, more carefully constructed than Miss Sontag's previous forays, are also much duller. How surprisingly banal, how tiresome Miss Sontag's militant language seems: "an erotics of agony," "exemplary," "excruciating," "ours is a time in which every intellectual or artistic or moral event is absorbed by a predatory embrace of consciousness: historicizing." Even the famous use of inverted commas cannot save Miss Sontag's daring cliches: "The Vietnamese are 'whole' human beings, not? 'split' as we are." Again and again Miss Sontag bemoans the loss of spontaneity, the deadening effects of analysis, all the while performing as the most abstract, benighted, "complex" savant. Of course, there are interesting or reflective passages: Miss Sontag is a serious and ambitious critic. Still, a private quarrel goes on between what she is and what she seeks, giving the aura of an embalmed intensity.